340. John ap Rice to Wriothesley. Sends a letter from one of the surveyors in Wales showing what report they make of this bearer, the prior of Caermerden, and his house. If my lord (fn. 1) wishes anything written or registered while I am away you may send it to my house here. London, 21 Aug.
341. Lord Sandys to Cromwell. Perceives by his letter that he did not know of the Deputy of Calais being at Guysnes Castle to demand the woods stored for its defence and that he advises lord Sandys to let him have it. Had already written to his deputy at Guysnes to deliver it, so that the King's works should not be hindered. Cromwell knows that such a house cannot be maintained without good and well foreseen provisions, whereof wood is one of the principal. They shall have it as he has Cromwell's writing for his discharge and for the restitution of as much again. As to Cromwell's bidding him to be a good father to his son John Sandys, the bearer, and to maintain him after his degree, thinks he maintains him well for the degree of a younger brother, considering that he has many other sons, daughters, and brother's children. Maintains John Sandys at Court, to serve their great master and obtain his favour, and come thereby to preferment towards his living. The Vyne, 21 Aug. Signed. 342. 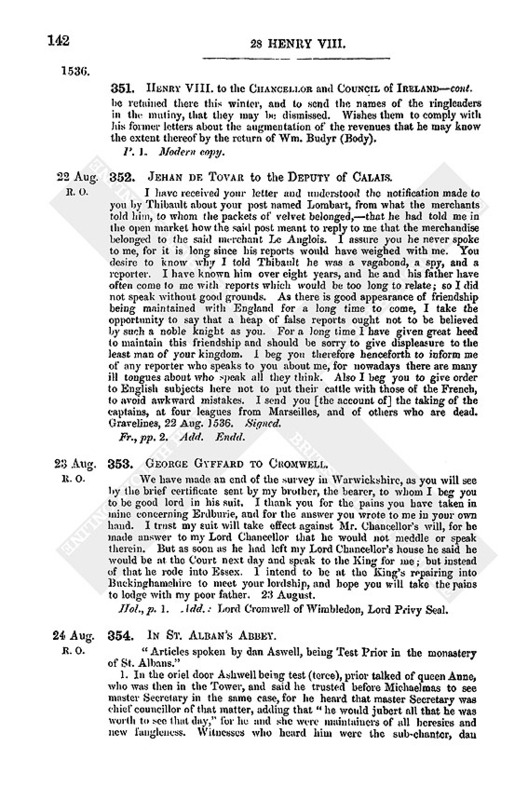 Marmaduke Abbot of Fountains to Cromwell. When I before received your letters for preferment of your servant, Will. Daill to the grange of Sutton, I pointed out that the said grange is necessary to the monastery for hospitality and pasturage, and your lordship took it only for an excuse. I assure you my reasons were unfeigned, and I made the like answer to the King when he wrote for one of his servants. Fountains, 21 Aug. Signed. 2. Duplicate of the preceding. Signed. 343. The Mayor and Council of Rye to Sir Thomas Audeley, Lord Chancellor. Sending the depositions of witnesses in the case of Henry Sogges, who was accused of pulling down part of the town wall to make an oven with. Rye, 21 Aug.
344. Walter Bucler to Lady Lisle. Your servant Hugh Gylys when here, in the absence of Mr. Barkers left all your affairs to Sir Guylliam LeGrace, a rich merchant, with a bill of remembrance translated into French, and for greater surety he left your bill of remembrance to Mr. Barker with Bekynsawe and me, desiring us to repair to LeGrace if need were. Your bill made mention of a diamond to perform the brooch of the Assumption of Our Lady, and Hugh Gyllys caused patterns of two brooches to be drawn, one with an image of Our Lady, the other with a personage sitting under a cloth of estate. These he carried with him to show your ladyship, and we await your further pleasure. We have brought the bearer your servant John Smyth both to the merchant and the goldsmith, of whom we have received all your "bagues" and delivered them in a box to Smyth. I have paid for the fashion as you will see by the enclosed bill, 17 fr. 1s. 9d., equal to 37s. 11½d. I beg you to write and thank LeGrace for his pains. Paris, 21 Aug. Hol., pp. 3. Add. : At Calais. 345. Jehan de Tovar to Lord Lisle. In answer to your letters, as to the packet of Geo. Traeps, which has been arrested by Antoine Soeckaer, receiver of the Emperor's toll, he and I together asked of the carrier to know to whom the goods belonged which he brought on the cars, which the said carrier could not tell, but could only say that they had laden them behind the market of Bruges, with instructions to bring it to Calais to an Englishman whom he could not name either. He said he had no letter or instruction to whom the goods belonged, and as the merchants had passed without speaking to the receiver of the toll, we determined to arrest the packet without knowing what was in it, till he should bring a certificate to whom the goods belonged. As you certify that the goods being 20 pieces of velvet belong to the said George Traeps, I have released the said packet for your sake, notwithstanding the proclamations against transporting merchandise out of these countries without safe conduct. As to the letter that you wrote on Saturday about a horse, which you say was taken by my orders from an English gentleman named Lyncolin, I have made inquiry, and find no horse has been taken by my command for some time. Three months ago, when I went in post from this town to Court, I met between Audeboeur and Nyeupoerte two or three horsemen, one on a very young horse with a tight rein and tight saddle, and I asked the gentlemen, one of whom was a German and the other spoke French, if they had a passport for that young horse. He who spoke French spoke also English, and replied that he had been asked to ride that horse, and it belonged to a merchant of Couloiennye, who sold it for 30 cr. to a Frenchman, on condition that he should deliver it on the English frontier. On this I arrested it, and the Englishman or Frenchman, I know not what he was, gave it up readily, and mounting on another little curtall, which he said belonged to himself, swearing that he was an Englishman, bade me adieu. After this the German mounted the horse, and returned with me to Audenboerch. I put up the horse at the Lion Inn, and ordered it to be well treated while I went to Court. An hour afterwards it fell down as if dead, and the stable boy went in haste to the farrier. The horse was laid up 10 or 12 days and became as thin as a herring and seemed on the point of death. On hearing of the matter, as the horse had been journeying all night, I sent a good farrier, who attended him four or five weeks, when he got somewhat better, but he is still very ill.
You have instructed the sieur Verra to speak to me of the said horse. You will understand it is confiscated for the reasons I have written. Gravelines, 21 Aug. 1536. Signed. 346. 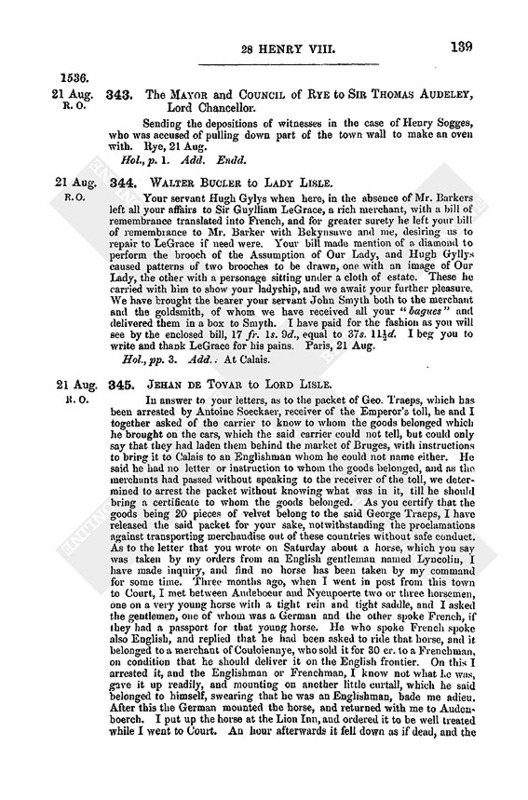 Guillaume le Gras to Lady Lisle. I have seen a letter from you to Mons. Bouchier, to send you back your rings left here in my charge by Hugh Gilles. I have delivered them to him accordingly to send you by the bearer, a messenger of Calais. 17l. 1s. 9d. has been paid for the new making of the fleur, as ordered by Gilles, and for the repairing of the golden image and for additional gold put into it, and in accordance with Hugh's instructions nothing shall be done about the other token (enseigne) which he had devised. Paris, 21 Aug. 1536. Hol. Fr., p. 1. Add. Inventory indented, made 22 Aug. 28 Hen. VIII., between Sir Ant. Wingfield, Sir Thos. Russhe, Rob. Southwell, and Thomas Mildmay, the King's commissioners, and Mary Page, abbess of Brusyarde; of the ornaments of the church and furniture of the different chambers, &c. which the abbess is to keep to the King's use. Total value, 40l. 14s. 5d. Signed by the abbess. 348. John Gostwyk to Cromwell. In behalf of the bearer, lately one of the clerks of my lord of Richmond's kitchen, for a renewal of the office of bailiff of Cottingham, Yorkshire, granted him by the said lord, and for his advancement to the service of my lady Mary, whose household is to be increased. London, 22 Aug. Signed. Harl. MS. 604, f. 62. B.M. Wright's Suppression of the Monasteries, 243. 349. Thomas Legh to Cromwell. Has, as commanded, visited the archdeaconry of Coventry, Stafford, Derby, and part of Cheshire, and perceives nothing lacking but godly instruction of the "rude and poor people," and reformation of the heads. Most of the knights and gentlemen live so incontinently, having concubines and their children openly in their houses, and putting away their wives, that the country is offended, and takes evil example of them. Sent commandment to them (for he could not speak with all, because they were at the assizes) to put away their concubines and take back their wives, or else appear before Cromwell, to show cause why they should not be compelled. As my lord of Norfolk is come to Court, pray have me in remembrance. Vale Royall, 22 Aug. Signed. R. O. St. P.II. 361. 350. Council of Ireland to Cromwell. Send their proceedings in this journey now finished since their letters by Thos Alen. The other battery, &c., were brought to Limerick on Sunday before the Assumption of Our Lady "by me," James Butler, and Donaugh Obreen. On Lady Day marched to Karyckogynnell, being recovered from them by tradiment, as they before wrote, and warded by men of James, selfstyled earl of Desmond, and the Brennes. Give an account of the assaults and capture of the castle. There were in it 46 men besides 17 killed. As the Deputy had previously warned them that if any of the army were killed they should all die, all were put to death except one of the chief of them, one of the Brenes (for whom great intercession was made and money offered) who was conveyed to Limerick and there arraigned and executed for treason. Commend the conduct of the soldiers of whom 30 were killed and wounded. The castle is committed to Ossory and James Butler as mentioned in their other letter. Have had, while waiting for the ordnance, communications with O'Brene and the pretended earl of Desmond. O'Brene will not conform to his promises of subjection, nor deliver the earl of Kildare's plate and goods; and moreover he maintains Kildare's second son (fn. 2) and divers servants of Kildare and of Thomas FitzGerald. The said Desmond was very reasonable and would give his two sons as hostages and abide by the order of the Deputy and Council about the earldom, as agreed by indenture between him and the Deputy. However, pondering his oath to O'Brene ("as he is a person esteemed greatly to regard his promise") that the one should not make an agreement without the other, and seeing that we could not abide in the country, we purposed to destroy O'Brene's country; but the army refused to go further without their wages. Albeit no shift could be made for the money we offered to leave them in Limerick, Cork, and Kilmahallock, where they could have food and drink upon our bond until the King's money should come, and overawe the rebels by their presence. They refused. So Loughgyr castle in the midst of Desmond's country where I, James Butler, kept a garrison for 20 days is deserted for none of my men or men of this country (except James FitzMaurice had been here to receive the same) will keep the place unless the Englishmen stay. Things have not succeeded as they would have done had the army tarried, among whom have been innumerable disorders, to the evil example of the Irish. Beg he will show the King the premises as he thinks fit. Unless the rebellion of O'Brene and Desmond be suppressed Munster will never be quiet; nor will the King recover Kildare's lands unless the Deputy and army remain about Limerick and Cork for a quarter of a year, as they would have done until All Saints' Day had they had money. Advise that James FitzMaurice should be sent over to be used as an instrument for the suppression of the pretended earl. 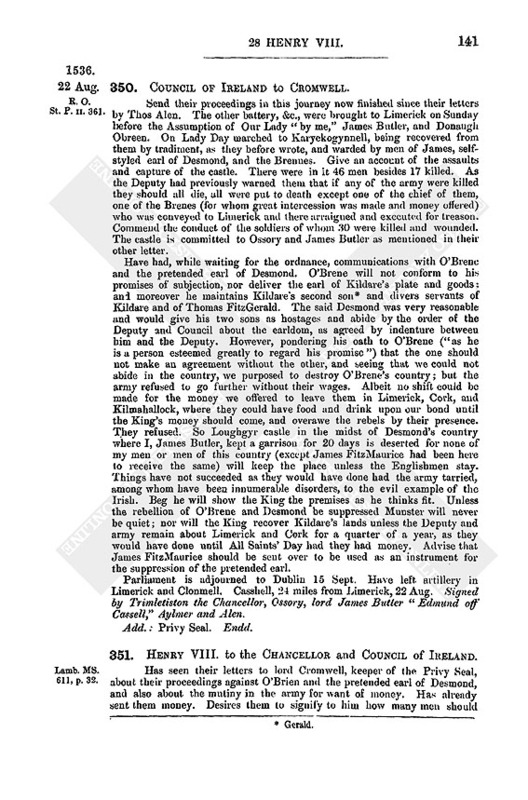 Parliament is adjourned to Dublin 15 Sept. Have left artillery in Limerick and Clonmell. Casshell, 24 miles from Limerick, 22 Aug. Signed by Trimletiston the Chancellor, Ossory, lord James Butler "Edmund off Cassell," Aylmer and Alen. Lamb. MS. 611, p. 32. 351. Henry VIII. to the Chancellor and Council of Ireland. Has seen their letters to lord Cromwell, keeper of the Privy Seal, about their proceedings against O'Brien and the pretended earl of Desmond, and also about the mutiny in the army for want of money. Has already sent them money. Desires them to signify to him how many men should be retained there this winter, and to send the names of the ringleaders in the mutiny, that they may be dismissed. Wishes them to comply with his former letters about the augmentation of the revenues that he may know the extent thereof by the return of Wm. Budyr (Body). 352. Jehan de Tovar to the Deputy of Calais. I have received your letter and understood the notification made to you by Thibault about your post named Lombart, from what the merchants told him, to whom the packets of velvet belonged,—that he had told me in the open market how the said post meant to reply to me that the merchandise belonged to the said merchant Le Anglois. I assure you he never spoke to me, for it is long since his reports would have weighed with me. You desire to know why I told Thibault he was a vagabond, a spy, and a reporter. I have known him over eight years, and he and his father have often come to me with reports which would be too long to relate; so I did not speak without good grounds. As there is good appearance of friendship being maintained with England for a long time to come, I take the opportunity to say that a heap of false reports ought not to be believed by such a noble knight as you. For a long time I have given great heed to maintain this friendship and should be sorry to give displeasure to the least man of your kingdom. I beg you therefore henceforth to inform me of any reporter who speaks to you about me, for nowadays there are many ill tongues about who speak all they think. Also I beg you to give order to English subjects here not to put their cattle with those of the French, to avoid awkward mistakes. I send you [the account of] the taking of the captains, at four leagues from Marseilles, and of others who are dead. Gravelines, 22 Aug. 1536. Signed. Fr., pp. 2. Add. Endd. 353. George Gyffard to Cromwell. We have made an end of the survey in Warwickshire, as you will see by the brief certificate sent by my brother, the bearer, to whom I beg you to be good lord in his suit. I thank you for the pains you have taken in mine concerning Erdburie, and for the answer you wrote to me in your own hand. I trust my suit will take effect against Mr. Chancellor's will, for he made answer to my Lord Chancellor that he would not meddle or speak therein. But as soon as he had left my Lord Chancellor's house he said he would be at the Court next day and speak to the King for me; but instead of that he rode into Essex. I intend to be at the King's repairing into Buckinghamshire to meet your lordship, and hope you will take the pains to lodge with my poor father. 23 August. Hol., p. 1. Add. : Lord Cromwell of Wimbledon, Lord Privy Seal. 354. In St. Alban's Abbey. "Articles spoken by dan Aswell, being Test Prior in the monastery of St. Albans." 1. In the oriel door Ashwell being test (terce), prior talked of queen Anne, who was then in the Tower, and said he trusted before Michaelmas to see master Secretary in the same case, for he heard that master Secretary was chief councillor of that matter, adding that "he would jubert all that he was worth to see that day," for he and she were maintainers of all heresies and new fangleness. Witnesses who heard him were the sub-chanter, dan Peter Catton, dan Bynnham, dan Newman, &c. 2. 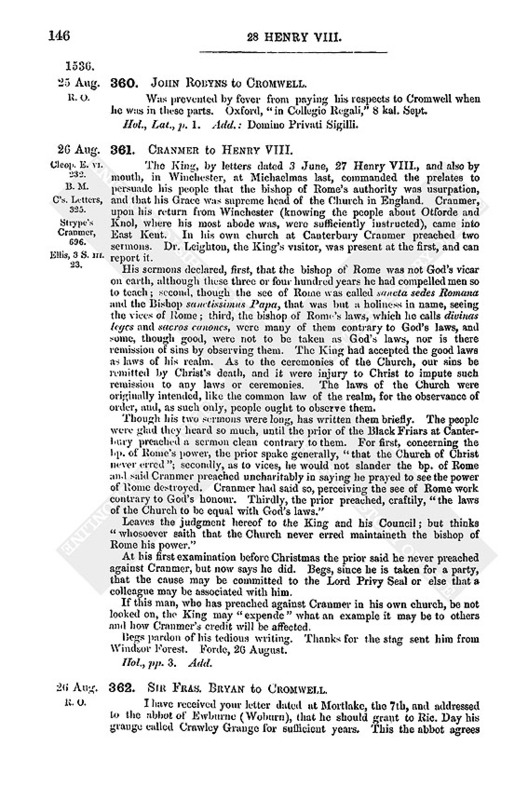 While the said test prior was sitting in the oriel at dinner with the brethren, Bacheler Stevenage complained of the fare as unwholesome and against the King's statutes; on which the test prior said, " What should we pass upon these statutes, which be made by a sort of light-brained merchants, and also heretics, Cromwell being one of the chief of them?" Bacheler Stevenage and others commanded him to hold his peace, for if it were known it would turn him to high displeasure. He answered, "What should we pass upon them that purposeth themself to destroy our religion? Let us pass upon the old customs and usages of our house." Witnesses named. 3. He called a young man named dan Newman into the shaving-house, who confessed that he meant to leave the monastery for the uncharitableness he found there, and claimed to have the King's authority by which all under the age of 22 should be put forth. The test prior answered, "I marvel that ye pass upon that commandment, which was not heard of this thousand year afore. The King hath done it on his high power, contrary to the law of God and man both." 4. Being at supper in the high prior's chamber, Dr. Gevyn and master Guynnett, and others of the brethren there spoke of the pulling down of the religious houses. The test prior answered, "I marvel that you will talk thereof; for so long as this King reigneth it shall be never at other point; for if he reign this seven years he purposeth to leave but four churches in England; that is to say, one church in the east, another west, and another church north, and another south." He had declared openly what a young man had told him in confession. Notwithstanding sufficient warning, the prior will not forbear this style of conversation; and therefore to avoid any guilty participation, they have set forth these articles. 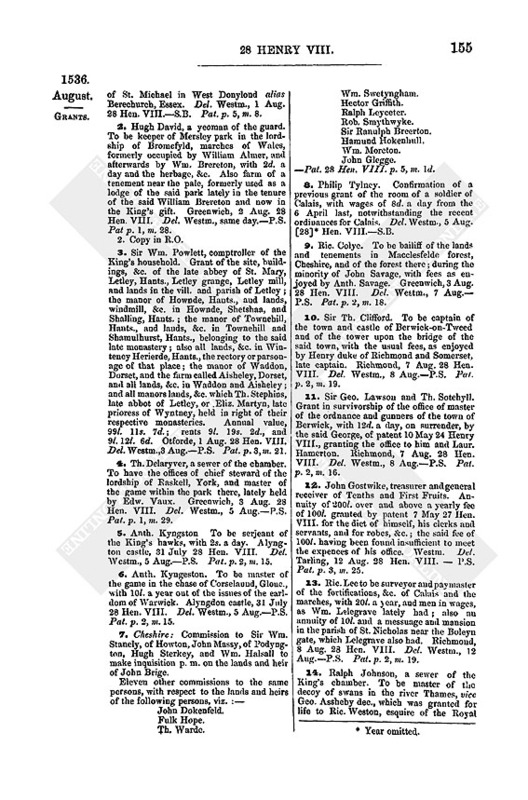 Names of witnesses are appended to each article. ii. Interrogatories on the above articles put up to the Lord Privy Seal by Thos. Newman, taken before the abbot of St. Albans, John Conyngesby, Ralph Rowlet, Edw. Broket, and Geo. Candyshe, 24 Aug. 28 Hen. VIII. 1. Whether the articles are a true copy, which Newman affirms. 2. That the prior affirmed that he thought the King was not privy to those articles. Thos. Bartylmowe, sub-chanter, attests the same, but he never heard the prior speak anything else of the King or the Council; which is also attested by Henry Bestney, second "serchen," Edw. Sybley, Thos. Bynham, and Peter Catton. The last deposes that he heard the said prior say, " he would lay 20l. that Mr. Cromwell should be in the Tower before Michaelmas day." 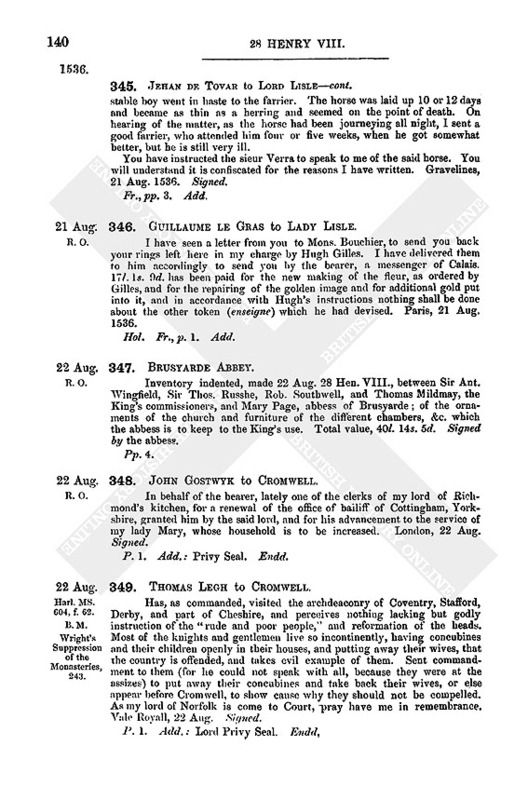 Other depositions by John Guynett, chaplain, Rob. Morton, keeper of St. Alban's shrine, who says he heard the prior say that now the King had pulled down the little houses, he would pull down the great ones. Signed by the deponents. Will. Asshwell, tertius prior, says in answer to these charges: 1. That he never spoke such words of queen Anne and Mr. Secretary. 2. Nor the words alleged in the second article, but only that the King and his Council would not break any laudable customs of the monastery. 3. and 4. He also denies the 3rd and 4th articles, but says he had heard it spoken of divers men that only four religious houses should be left in England, &c. 5. That he never disclosed the confession alleged. Signed. iii. Ric. 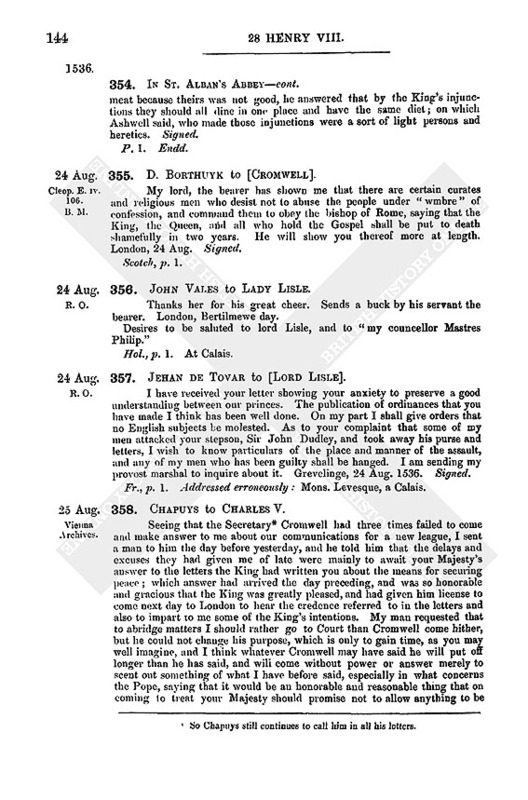 Stevynnage deposes, denying the correctness of the first and second articles; but states that when certain of the brethren at refection, dining in the "frater" came into the oriel and would have part of their meat because theirs was not good, he answered that by the King's injunctions they should all dine in one place and have the same diet; on which Ashwell said, who made those injunctions were a sort of light persons and heretics. Signed. Cleop. E. iv. 106. B. M.
355. D. Borthuyk to [Cromwell]. My lord, the bearer has shown me that there are certain curates and religious men who desist not to abuse the people under "wmbre" of confession, and command them to obey the bishop of Rome, saying that the King, the Queen, and all who hold the Gospel shall be put to death shamefully in two years. He will show you thereof more at length. London, 24 Aug. Signed. 356. John Vales to Lady Lisle. Thanks her for his great cheer. Sends a buck by his servant the bearer. London, Bertilmewe day. Desires to be saluted to lord Lisle, and to "my councellor Mastres Philip." Hol., p. 1. At Calais. 357. Jehan de Tovar to [Lord Lisle]. I have received your letter showing your anxiety to preserve a good understanding between our princes. The publication of ordinances that you have made I think has been well done. On my part I shall give orders that no English subjects be molested. As to your complaint that some of my men attacked your stepson, Sir John Dudley, and took away his purse and letters, I wish to know particulars of the place and manner of the assault, and any of my men who has been guilty shall be hanged. I am sending my provost marshal to inquire about it. Grevelinge, 24 Aug. 1536. Signed. Fr., p. 1. Addressed erroneously: Mons. Levesque, a Calais. 358. Chapuys to Charles V.
Seeing that the Secretary (fn. 3) Cromwell had three times failed to come and make answer to me about our communications for a new league, I sent a man to him the day before yesterday, and he told him that the delays and excuses they had given me of late were mainly to await your Majesty's answer to the letters the King had written you about the means for securing peace; which answer had arrived the day preceding, and was so honorable and gracious that the King was greatly pleased, and had given him license to come next day to London to hear the credence referred to in the letters and also to impart to me some of the King's intentions. My man requested that to abridge matters I should rather go to Court than Cromwell come hither, but he could not change his purpose, which is only to gain time, as you may well imagine, and I think whatever Cromwell may have said he will put off longer than he has said, and will come without power or answer merely to scent out something of what I have before said, especially in what concerns the Pope, saying that it would be an honorable and reasonable thing that on coming to treat your Majesty should promise not to allow anything to be done against the King, either at the Council or elsewhere by reason of his withdrawal from the Church. Cromwell told my man that the French ambassador had assured the King that the Prince Dasculy (fn. 4) had caused the Dauphin to be poisoned, and intended to do the same to the French king and his two other children, and since wickedness had grown so bold this King ought to take good heed to himself. 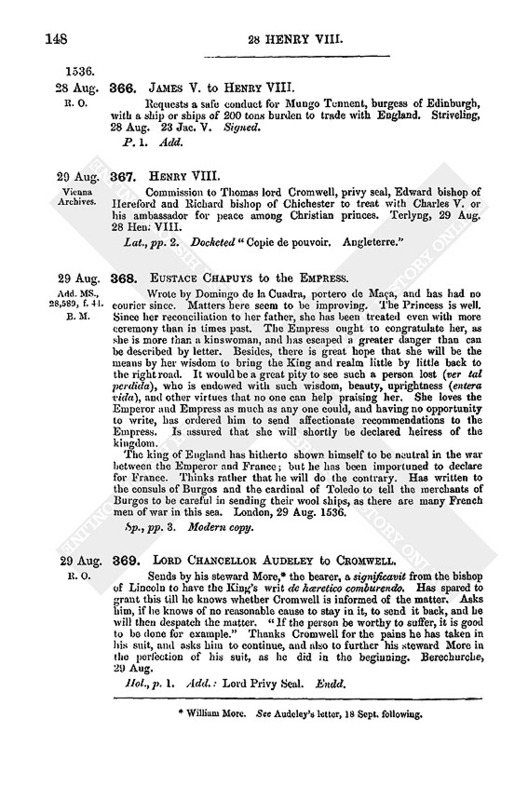 This the King had reported to Cromwell, who answered that he need not fear such poison, and there was a poison far more dangerous, viz., the secret menaces of the French, who would have treated to the prejudice of the King and all his realm as Granvelle had lately declared to the English ambassador, and as Chapuys had several times shown. Cromwell has sent me by my man who arrived from Court this morning, your Majesty's letters of the 11th instant, of which, according to your instructions, I send by the bearer a copy to the Queen Regent in Flanders. I shall not fail to use the care indicated in the cipher. As to the documents written at the camp by Ferjoux, I have not yet received them. On the 15th I learned by a servant of the bishop of Winchester, whom he despatched from Lyons, that your Majesty's men had taken and defeated 3,000 French, among whom were 500 horse and 7 chief captains. Two days ago the neutrality was proclaimed holding the subjects of your Majesty and those of the king of France in equal protection here, and forbidding the English under great penalties to traffic openly or secretly in merchandise belonging to either party. This last clause was added because several ships have been arrested in Flanders, having goods belonging to Frenchmen laden in them. A Scotchman tells me that the king of Scots was returning to Edinburgh, and that his voyage had not been with the view of crossing to France as reported, but only to visit some of the Orkney Isles where there had been some disturbance. London, 25 Aug. 1536. Fr., from a modern copy, pp. 3. Knows not what to add to the news he has written to the Emperor, except that he has heard that on Sunday last they began to publish the Princess heir apparent, in a parish church near the writer's lodging. She is very well, and is every day better treated; in which the more I think of it and of the hope it gives of putting the King on the right road, both as concerns his religion and his relations to the Emperor, considering also the great dangers she has escaped, and the inextricable confusion which would have ensued, I think the Princess has acted more prudently, whatever Count Cifuentes and Doctor Ortiz may say, who in my opinion have not considered all the circumstances. Everything well weighed, it seems to me that the Pope ought to approve of what is done, and if it were still to do should order it to be. I have written to them fully, but as I know they will write thither (to you) I could not forbear to point this out. London, 25 Aug.
Just as I was about to close this packet Cromwell has sent to me by a clerk to say he will be here without fail at a lodging he has in the fields next mine, and begged me to be more pliant this time than I had been hitherto. He brings with him the bishops of Hereford and Chichester, who have hitherto professed to be good Imperialists, which gives me better hope than I had, especially as I have heard that of late the King had given a dry and curt answer to the French ambassador that it was mere waste of time to ask him to assist the French. May God inspire him to declare himself on his Majesty's side, for which I will use as great efforts as if it were to win Paradise. 360. John Robyns to Cromwell. Was prevented by fever from paying his respects to Cromwell when he was in these parts. Oxford, "in Collegio Regali," 8 kal. Sept. Hol., Lat., p. 1. Add. : Domino Privati Sigilli. Cleop. E. vi. 232. B. M. C's. Letters, 325. Strype's Cranmer, 696. Ellis, 3 S. III. 23. 361. Cranmer to Henry VIII. The King, by letters dated 3 June, 27 Henry VIII., and also by mouth, in Winchester, at Michaelmas last, commanded the prelates to persuade his people that the bishop of Rome's authority was usurpation, and that his Grace was supreme head of the Church in England. Cranmer, upon his return from Winchester (knowing the people about Otforde and Knol, where his most abode was, were sufficiently instructed), came into East Kent. In his own church at Canterbury Cranmer preached two sermons. Dr. Leighton, the King's visitor, was present at the first, and can report it. His sermons declared, first, that the bishop of Rome was not God's vicar on earth, although these three or four hundred years he had compelled men so to teach; second, though the see of Rome was called sancta sedes Romana and the Bishop sanctissimus Papa, that was but a holiness in name, seeing the vices of Rome; third, the bishop of Rome's laws, which he calls divinas leges and sacros canoncs, were many of them contrary to God's laws, and some, though good, were not to be taken as God's laws, nor is there remission of sins by observing them. The King had accepted the good laws as laws of his realm. As to the ceremonies of the Church, our sins be remitted by Christ's death, and it were injury to Christ to impute such remission to any laws or ceremonies. The laws of the Church were originally intended, like the common law of the realm, for the observance of order, and, as such only, people ought to observe them. Though his two sermons were long, has written them briefly. The people were glad they heard so much, until the prior of the Black Friars at Canterbury preached a sermon clean contrary to them. For first, concerning the bp. of Rome's power, the prior spake generally, "that the Church of Christ never erred"; secondly, as to vices, he would not slander the bp. of Rome and said Cranmer preached uncharitably in saying he prayed to see the power of Rome destroyed. Cranmer had said so, perceiving the see of Rome work contrary to God's honour. Thirdly, the prior preached, craftily, "the laws of the Church to be equal with God's laws." Leaves the judgment hereof to the King and his Council; but thinks "whosoever saith that the Church never erred maintaineth the bishop of Rome his power." At his first examination before Christmas the prior said he never preached against Cranmer, but now says he did. Begs, since he is taken for a party, that the cause may be committed to the Lord Privy Seal or else that a colleague may be associated with him. If this man, who has preached against Cranmer in his own church, be not looked on, the King may "expende" what an example it may be to others and how Cranmer's credit will be affected. Begs pardon of his tedious writing. Thanks for the stag sent him from Windsor Forest. Forde, 26 August. 362. Sir Fras. Bryan to Cromwell. I have received your letter dated at Mortlake, the 7th, and addressed to the abbot of Ewburne (Woburn), that he should grant to Ric. Day his grange called Crawley Grange for sufficient years. This the abbot agrees to do notwithstanding his former grant to another man, but objects to give him the warren of coneys, which would be a loss to the house of 40l. a year. My own servant, keeper of Brokeburrow, had the same warren in farm and let it over again to one Pounter, and it was such a loss to the abbot that he gave my servant 5l. a year and Pounter 30l. to redeem it. As I am steward of the house, I beg your lordship not to desire the warren. Ampthill, 26 Aug. Signed. P. 1. Add., Privy Seal. Endd. 363. The Town of Dunkirk to Lord Lisle. We have received your letters dated on St. Bartholomew's day, complaining of the capture of two English ships by vessels of this town, and demanding redress, with a statement that neither the ships, men, or goods were French. The cognisance of such matters belongs entirely to the Emperor's Admiral. We have done our utmost in the matter by calling before us the captains and officers of the said ships and the admiral lieutenant, and declaring to them what seemed to us the truth; but notwithstanding our remonstrances the men of war refused to liberate them until the admiral is informed of everything. Dunkirk, Sat., 26 Aug. '36. 364. Herry Polsted to Cromwell. According to his letter received last night about 8 o'clock, has sent him the award. If, as Cromwell wishes, he puts out the clause concerning the common which the tenants claim in Offington and Barton, the abbot will run in danger of his bond, because the award runs that he should make an indefeasible lease. As he perceives by Mr. Androwes that the tenants are "adanymated against the said Audelet" by the said clause, Cromwell may cause the abbot to be bound to Audelet with the condition of which he sends a note. Doubts not the abbot will seal it on Cromwell's note, though it is not in the award. Thinks Cromwell had better send the award to the parties, lest Mr. Button or Mr. Andrewes do not deliver it in time, so that it becomes void. The short day given in the obligations was by consent of the parties, in the hope that Cromwell would have sealed the award before he went to Court. The Rolls, Monday. Signed. 365. Sir W. Barantyne to Cromwell. I received, on the 27th, your letter dated 10 Aug., touching a complaint made to the Council that I had made deceitful bargains with my father-in-law Sir Roger Lewkenore. Denies the charge. His father-in-law has made assurance of the reversion of all his inheritance to him and his wife and the heirs of both their bodies, and they have two sons alive. The last articles he had of him, of which he sent Cromwell a copy as desired, were sent to him by his father-in-law and my lady, and the former sealed and subscribed them in his presence with perfect goodwill. The other writings which Cromwell has seen are not with him at present, some are in London and some in Sussex, but he will get copies. Haseley, 28 Aug. Signed. 366. James V. to Henry VIII. Requests a safe conduct for Mungo Tennent, burgess of Edinburgh, with a ship or ships of 200 tons burden to trade with England. Striveling, 28 Aug. 23 Jac. V. Signed. Commission to Thomas lord Cromwell, privy seal, Edward bishop of Hereford and Richard bishop of Chichester to treat with Charles V. or his ambassador for peace among Christian princes. Terlyng, 29 Aug. 28 Hen. VIII. Lat., pp. 2. Docketed "Copie de pouvoir. Angleterre." Add. MS., 28,589, f. 44. B. M.
368. Eustace Chapuys to the Empress. Wrote by Domingo de la Cuadra, portero de Maca, and has had no courier since. Matters here seem to be improving. The Princess is well. Since her reconciliation to her father, she has been treated even with more ceremony than in times past. The Empress ought to congratulate her, as she is more than a kinswoman, and has escaped a greater danger than can be described by letter. Besides, there is great hope that she will be the means by her wisdom to bring the King and realm little by little back to the right road. It would be a great pity to see such a person lost (ver tal perdida), who is endowed with such wisdom, beauty, uprightness (entera vida), and other virtues that no one can help praising her. She loves the Emperor and Empress as much as any one could, and having no opportunity to write, has ordered him to send affectionate recommendations to the Empress. Is assured that she will shortly be declared heiress of the kingdom. The king of England has hitherto shown himself to be neutral in the war between the Emperor and France; but he has been importuned to declare for France. Thinks rather that he will do the contrary. Has written to the consuls of Burgos and the cardinal of Toledo to tell the merchants of Burgos to be careful in sending their wool ships, as there are many French men of war in this sea. London, 29 Aug. 1536. 369. Lord Chancellor Audeley to Cromwell. Sends by his steward More, (fn. 6) the bearer, a significavit from the bishop of Lincoln to have the King's writ de hæretico comburendo. Has spared to grant this till he knows whether Cromwell is informed of the matter. Asks him, if he knows of no reasonable cause to stay in it, to send it back, and he will then despatch the matter. "If the person be worthy to suffer, it is good to be done for example." Thanks Cromwell for the pains he has taken in his suit, and asks him to continue, and also to further his steward More in the perfection of his suit, as he did in the beginning. Berechurche, 29 Aug.
370. John Husee to Lady Lisle. I have written to my lord how Mr. Wyndsor and I have sped with Mr. Hide. I fear if we trust him my lord will be deceived. The matter will require speedy diligence. When the chancellor of the Augmentations comes I will solicit my lord's desire. By his indentures with the chancellor of Winchester, my lord is quite debarred from wood sales and other profits. There are two or three that will offer 200 marks for the reversion of the 20 mark land. As to the Queen, I will solicit according to your request. Mr. John Basset is now merry in Hampshire, and so is Mr. George, but he lacks many things which I will prepare for him. Towards Michaelmas I trust you will have him at Calais. Edw. Russell (fn. 7) has promised to come with him. You have forgotten to answer the monk of Netley for his letter. As to your weir, I will apply to Mr. Popley for a letter to remedy it. London, 29 Aug.
371. Robert Seymore to Cromwell. Desires that his suit may have an end at Grafton. Has been a long suitor, and at great charges. When he first began he trusted if there had been "but syx t'a byn holpyn" he should have been one of them. Has still some hope, since the King has shown him favor, to be dispatched before Cromwell leaves Grafton. Woulfhaull, 30 Aug. Signed. 372. The Abbot of Tower Hill. See Grants in August, No. 37. 373. Robt. Prior of Lewes to Cromwell. I have received your letters in favor of Thomas Awdeley, the King's servant, to have my farm of Swanburgh with the parsonage adjoining. All I have is at the King's command, but I have nothing but the said farm, and grange, and parsonage to maintain my house and hospitality, which, no doubt, it is your pleasure should continue. You commanded me, in presence of my lord of Norfolk, my founder, to call in such leases as I had granted, and, for the maintenance of hospitality, keep them thenceforth in my own hands, notwithstanding any letter thereafter to the contrary. Lewes, 31 Aug. Signed. 374. Robert Forthe to Wriothesley. Ventures to write by his servant, who is going to Court, to desire Wriothesley to keep him in remembrance. London, 31 Aug. Hol., p. 1. Add. : At the Court. Endd. : Mr. Forde of the Privy Seal. Shrewsb. MSS. A. f. 55. Coll. of Arms. Receipt given 31 Aug. 28 Hen. VIII to George earl of Shrewsbury by Will. Smyth, one of the collectors appointed by the Lord Chancellor and the duke of Norfolk for assessing peers of the realm, for 38l. 6s. 8d. as the first payment of the subsidy granted in 26 Hen. VIII. Signed. 376. Pole to Card. Contarini. Sees that the Cardinal never loses an opportunity of assisting him. Would be glad not only to come to him but to live with him for ever. Must, however, await the return of his messenger from England, at least for 16 days, as he may be detained there. Will not wait longer. Will have the best possible conductors in his journey, the bishops of Verona and Chieti (Theatinus), with whom he has conferred much about it, as the former came salutandi senatus causa and to explain the Pope's intention in summoning him. Verona will take him the best ways through Tuscany. Only regrets that "our abbot" cannot accompany him as the archbishop of Salerno had promised, who expects him in Umbria. Hears from the English ambassador in France (fn. 8) that in England some nobles are condemned to extreme punishment; that he (fn. 9) who had begun courageously to vindicate the Pope's authority in Ireland, and had afterwards surrendered to the King on a promise of pardon has been condemned with his four uncles; that a brother of the duke of Norfolk, for secretly marrying a daughter of the late queen of Scotland, the King's sister, has been condemned to death along with his wife, unless the judgment be mitigated by the King's clemency. But I rather think that in these cases the King wishes an opportunity of showing mercy, and that is why judgment has been passed on them; for their deaths would be so unjust as to create intolerable hatred, the Irishman having relied on a public promise, and the other being condemned only on an ex post facto law. We shall soon know. I have also received some printed articles of religion in English, in which I find nothing much at variance with the Catholic standard, except that their authorship is ascribed to the King in the title—a thing of which it is difficult to say whether it be more foolish or impious. They treat of the Sacraments, Invocation of Saints and Purgatory, much after the old manner. The mercy of God has protected the faith of the people. Venice, prid. kal. Sept. 1536. R. O. Wilkins III. 813. Burnet iv. 308. 377. Injunctions to the Clergy. Injunctions issued by Cromwell, lord Privy Seal, to be observed by all persons having cure of souls or spiritual administration within the deanery of —, and to be enforced by his commissary. In these injunctions the clergy are directed how they shall preach and what subjects they shall insist upon. They are to teach all children and servants the Paternoster, the Articles of the Faith, and the Ten Commandments in the vulgar tongue. They are not to haunt alehouses, or play at cards; and every one beneficed above 20l. yearly shall distribute the 14th (40th ?) part of his revenues, lest he be noted of ingratitude in not imparting the 40th portion. Dated 1536, —Aug. (fn. 10) 28 Hen. VIII. 70. (fn. 8) B. M.
378. Sir Robert Constable to —. I pray your lordship to give Sir Roger Gray peremptory warning to keep his day better . . . . else at his peril. I have twice taken up . . . . commandment, and yet I had a privy loss, and I humbly pray your lordship no more to entreat me for him. The Emperor and the French king have made two sure camps, well fortified with ordnance. Whoever breaks first is in jeopardy. It is said that the bishop of Rome and the Venetians have raised an army of 20,000 Italians, of which the Medicis are captains to act against the Emperor. They intend to break the siege of Tyrwyn (Turin), which the French won from the duke of Savoy, and then join the French king in Provence. If the Emperor will suffer the duke of Saxony and the Lutherans, they will gladly make war against the bishop of Rome, which they would have done long since if the Emperor would have allowed them. The countie of Nasso continues his siege at Penoon (Peronne) in Picardy. He has been several times repulsed, but intends to stay till he takes it, when he will have no stop to Paris but by battle. "My lord here is humberyng of a new parliament." 379. 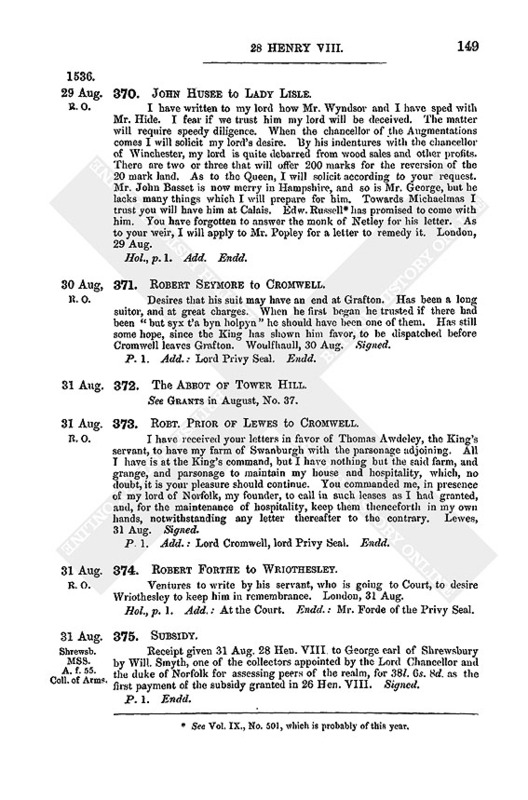 [Cromwell] to John Whalley and other of the King's Officers at [Dover]. Has admitted John Golde, the bearer, to be at the King's works at Dover, head clerk for the King, and keep his books as he has been used. They are to pay him 12d. a day, and also the arrears due to him. At— (blank),—Aug. Extracts made by John Stilman, notary public, from the register of bishop Sherbourn concerning an original foundation for the improvement of the cathedral choir. Lat., pp. 3. Endd. : Quoddam statutum sive ordinatio quædam in ecclesia cathedrali Cicestrensi. A docket of particular sums contained in three several warrants to be at this time signed for money paid by Mr. Gostyk. A.—To Thomas Hennage for the King's privy coffers, 2,000l. The prior of Newerk, master of the works at Hampton Court, for the same, 1,000l. Wm. Gonson for the apparelling of certain ships, 200l. Edmond Sexten and Robt. Cowley, of Ireland, in reward at their last departing, 26l. 13s. 4d. John Whalley, master of the works at Dover, 800l. Sir Wm. Kingston "for a composition for such jewels and apparel as the late Queen had in the Tower," 100l. The same "for money delivered unto her to give in alms before her death," 20l. The executioner of Calais, for his reward and apparel, 100 crs., 23l. 6s. 8d. The said Sir Wm. Kingston for the late Queen's diets when in the Tower, 25l. 4s. 6d. Richard Caundishe for certain provisions by him made in Hamburghe, 57l. 15s. 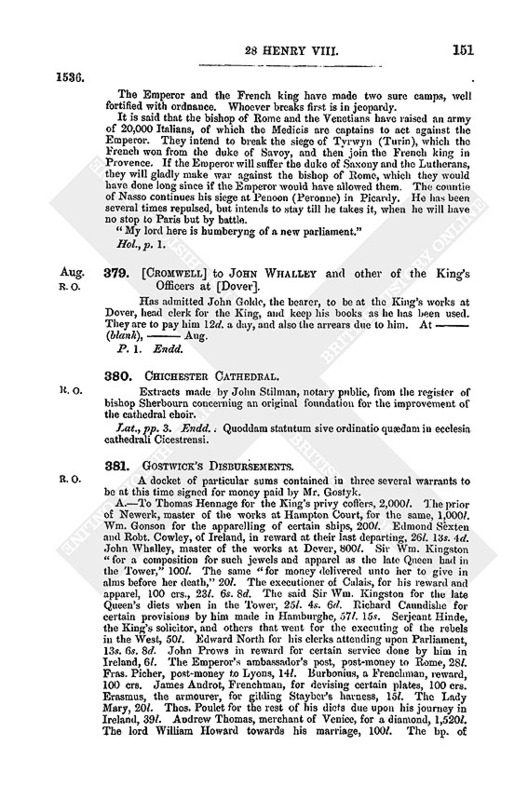 Serjeant Hinde, the King's solicitor, and others that went for the executing of the rebels in the West, 50l. Edward North for his clerks attending upon Parliament, 13s. 6s. 8d. 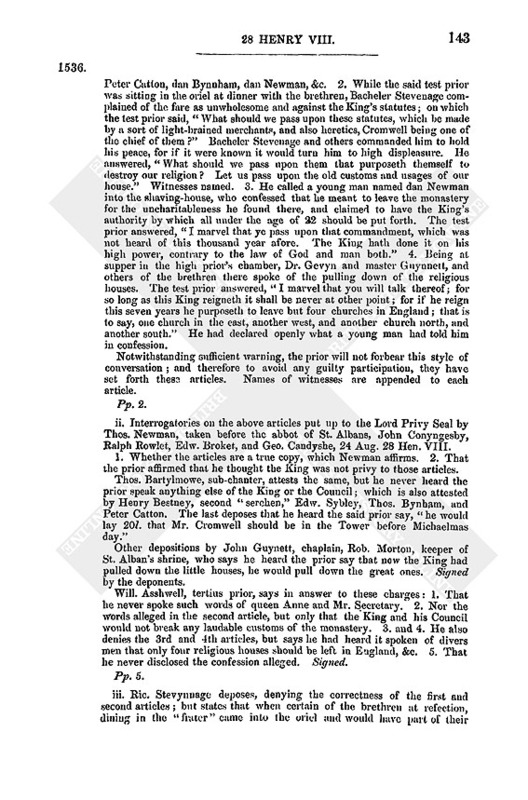 John Prows in reward for certain service done by him in Ireland, 6l. The Emperor's ambassador's post, post-money to Rome, 28l. Fras. Picher, post-money to Lyons, 14l. Burbonius, a Frenchman, reward, 100 crs. James Androt, Frenchman, for devising certain plates, 100 crs. Erasmus, the armourer, for gilding Stayber's harness, 15l. The Lady Mary, 20l. Thos. Poulet for the rest of his diets due upon his journey in Ireland, 39l. Andrew Thomas, merchant of Venice, for a diamond, 1,520l. The lord William Howard towards his marriage, 100l. The bp. of Winchester for a prest upon his diets, 233l. 6s. 8d. Richard Caundishe in prest for provision of cables, 900l. B.—Sir John Fitzjames half year's fee, 48l. 18d. Sir John Baldewyn, the like, 41l. 6s. 11d. Sir Anth. Fitzherbert, Sir John Porte, Sir Thos. Engleffeld, Sir Wm. Shelley, Sir John Spilman, and Sir Walter Luke, for the like, 32l. 18s. 11d. each (except Shelley, who has 27l. 18s. 2d.) Sir Richard Lister, one of the justices of assise, 100s. 10d. Chr. Hales, the King's attorney, 8l. 4s. 10d. Sir Thos. Willoughby, Chr. Jennye, and John Hinde, King's serjeants-at-law, 10l. 15s. 2d. each. Humphrey Brown, one of the said serjeants, 113s. 4d. Robt. Cattelyn for his half year's annuity making out process, 100s. Divers messengers riding with privy seals, 18l. 10s. 10d. Wm. Gonson for reparations of ships, 1,000 mks. John Gresham for money taken of him by exchange for the bp. of Herford, 100l. Wm. Walter surveying of the certificate of the tenths, in cos. Glouc. and Salop, 7l. 6s. 8d. 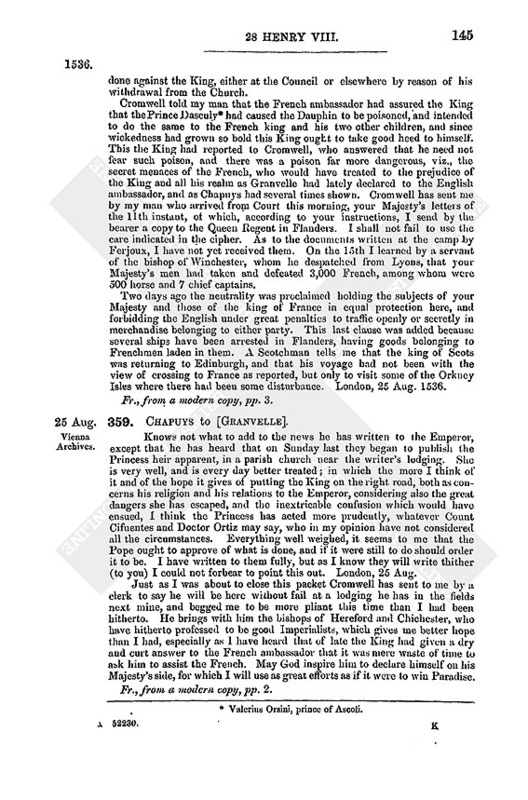 Andrew Flamok, bringing up certain evidence belonging to the earldom of Warwick, 36s. 6d. Annuities to Wm. Chomley, 6l. 13s. 4d. ; John Bury, Richard Tomeo, and Wilbrom, 100s. each; and Bernarde van Meale, 23l. 6s. 8d. Thos. Parry for his costs in the suppression of Bilsington, 22s. 7d. Bp. of Herford in reward, 114l. 11s. 11d. James Nedam for repairs at the Tower, 50l. Benedict and John, Florentynes, gravers, for April, 9l 8s. 8d. Item, an obligation wherein Thomas Gildon standeth bound in 100s. for the fine of knighthood to be delivered unto him. 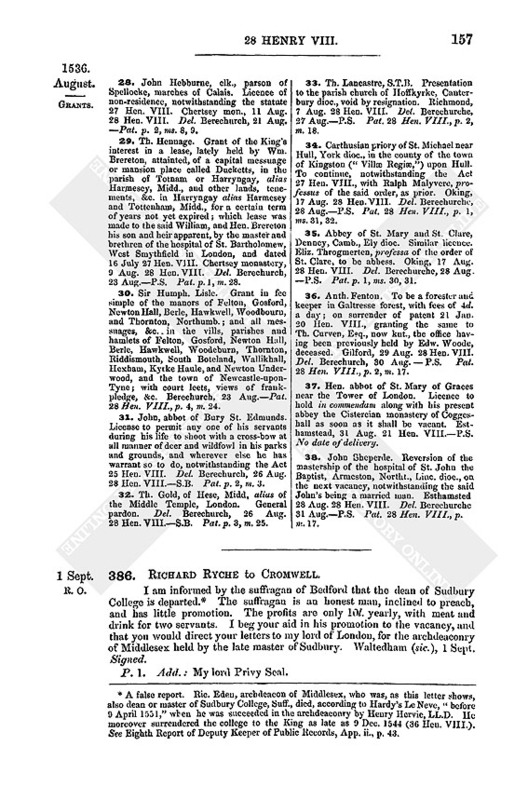 To Richard Crumwell for his expenses in the suppression of Tyltye, 4l. 8s. 4d. Richard Houghe, riding from London to Winchester and bringing prisoners thence, 4l. 22d. C.—To the bp. of Herford upon the determination of his diets, 100l. Wm. Shirlonde in full payment of his diets, 8l. 4s. Thos. Wryothesley, annuity for one quarter, 10l. My lord Privy Seal, for redeeming of certain emeralds that were stolen out of the abbey of Westm. and conveyed beyond sea, 88l. 3s. 4d. Hubbert Morret, jeweller of Paris, for jewels bought by the King, 282l. 6s. 8d. John Angel, jeweller of Paris, ditto, 1,873l. 13s. 4d. Longegraunt, merchant of Flanders, for arras, 630l. Chr. Millener for goldsmiths' work, 206l. 4s. 2d. The foresaid John Longegraunte for three rings with diamonds, 233l. 6s. 8d. Dr. Hethe, residue of his diets, 24l. Mrs. Anne de la Roche in reward, 20l. The earl of Desmond in reward by the King's command, 40l. To be sent into Ireland, 5,000l. Robt. Fouler towards the building of Calais, 1,000l. Roger Basing for wines, 600l. 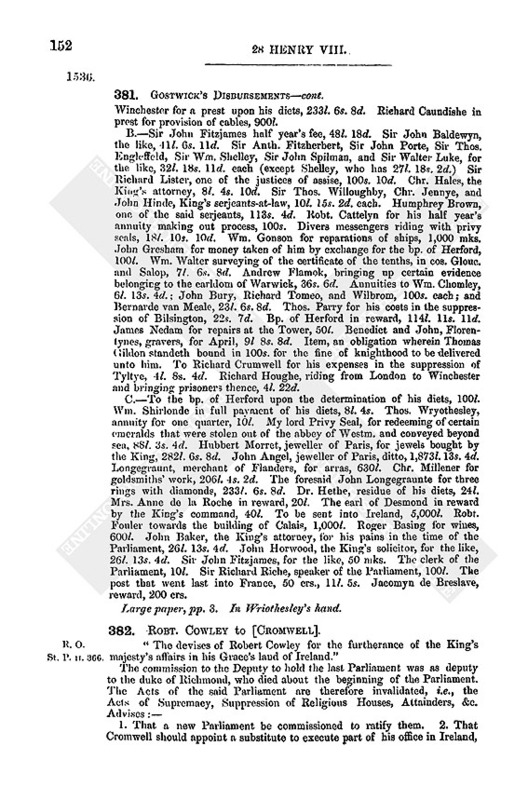 John Baker, the King's attorney, for his pains in the time of the Parliament, 26l. 13s. 4d. John Horwood, the King's solicitor, for the like, 26l. 13s. 4d. Sir John Fitzjames, for the like, 50 mks. The clerk of the Parliament, 10l. Sir Richard Riche, speaker of the Parliament, 100l. The post that went last into France, 50 crs., 11l. 5s. Jacomyn de Breslave, reward, 200 crs. Large paper, pp. 3. In Wriothesley's hand. R. O. St. P. ii. 366. 382. Robt. Cowley to [Cromwell]. "The devises of Robert Cowley for the furtherance of the King's majesty's affairs in his Grace's land of Ireland." 1. That a new Parliament be commissioned to ratify them. 2. That Cromwell should appoint a substitute to execute part of his office in Ireland, and stop the Irish from recourse to the bishop of Rome. 3. That all "provisours going to Rome, and papists," should be punished extremely. 4. The "pretensed" earl of Desmond has seized upon Kildare's lands in Limerick. The Deputy and Council should recover the said lands, and reduce the said Desmond to allegiance, or else prosecute him as a rebel. 5. Young Gerot, Jas. Delahide, and their accomplices should be apprehended. I delivered your lordship, in Canterbury, the writings sent from the Master of the Rolls, among them a book of ordnance to be sent to Ireland. Please learn the King's pleasure about that and the Chancellorship of Ireland. 2. Extracts from the headings (1) of the instructions given to Sir Wm. Skeffington, and (2) of the statutes of Ireland passed in the Parliament of Dublin, 1 May 28 Hen. VIII., before lord Leonard Gray. In each of these the Deputy is styled deputy to the duke of Richmond, and this is underlined. Modern copy, p. 1. Endd. : The style of the duke of Richmond. R. O. St. P. II. 367. 1. Is the commission to the Deputy to hold Parliament as deputy to the King and to the duke of Richmond, late lieutenant, now valid? Will the King's Council examine past enactments while the Parliament yet continues, —amongst others, an Act of 10 Henry VII. giving the earldoms of March and Ulster to the King? A. To be considered by the Lord Chancellor and learned Council. 2. In the Act resuming the lands of absentees, lady Seyntleger's portion is not comprised, "which is all Master Seyntleger's portion during her life, &c." A. She must have it for term of life. 3. Let it be enacted that officers of the courts and clerks exercise their offices in person, and meanwhile let the Treasurer pay no fees to those who do not use their offices in person. A. As good an Act as can be. 4. That the Treasurer may know about the appointment of officers in the King's lordships, and their fees. A. "Respectuatur." 5. That the Treasurer be discharged of going to wars, but apply his office; and now he is discharged of all the King's retinue save 50, let a captain be appointed to the said 50 to attend the Treasurer in surveying the King's lands, &c. A. A letter of discharge to the Treasurer to this effect. 6. To know how the Treasurer shall order Sir James Fitzgerald's and Richard's lands, both of their own and their wives' right. That known the Act of their attainder must be certified into Ireland. A. According to the laws of the land. 7. A commission to be sent for the granting of dispensations and faculties. A. Respectuatur. 8. And for visiting the clergy. A. Respectuatur. 9. Whether the King or Deputy shall have the fines of all pardons granted? A. Half to the King and half to the Deputy. 10. Ditto for fines levied upon any Irishman at the conclusion of peace. 11. That it be enacted that two "cessours" be appointed in every shire to assess impositions. A. Refer to the Council. 12. That the King's officers take no extortionate fees. A. Very good. 13. Ditto for "ordinaries, serjeants, and the like." 4. Modern copy of §3. 383. Charles V. and Francis I. 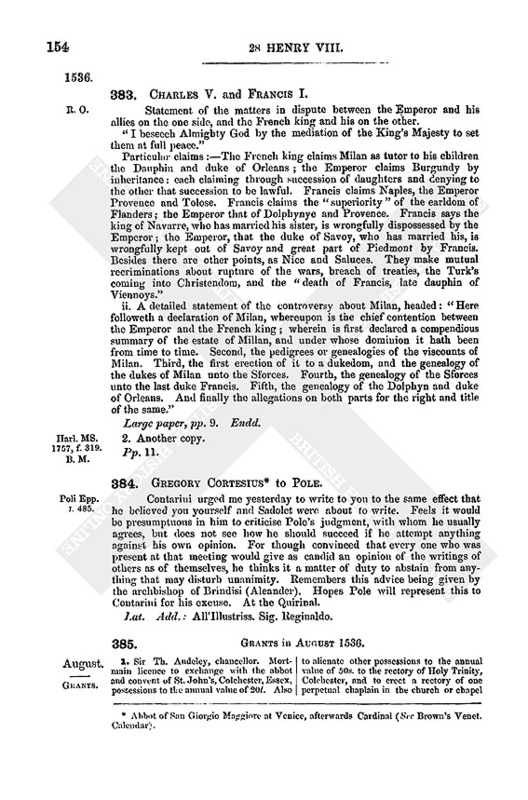 Statement of the matters in dispute between the Emperor and his allies on the one side, and the French king and his on the other. "I beseech Almighty God by the mediation of the King's Majesty to set them at full peace." Particular claims:—The French king claims Milan as tutor to his children the Dauphin and duke of Orleans; the Emperor claims Burgundy by inheritance: each claiming through succession of daughters and denying to the other that succession to be lawful. Francis claims Naples, the Emperor Provence and Tolose. Francis claims the "superiority" of the earldom of Flanders; the Emperor that of Dolphynye and Provence. Francis says the king of Navarre, who has married his sister, is wrongfully dispossessed by the Emperor; the Emperor, that the duke of Savoy, who has married his, is wrongfully kept out of Savoy and great part of Piedmont by Francis. Besides there are other points, as Nice and Saluces. They make mutual recriminations about rupture of the wars, breach of treaties, the Turk's coming into Christendom, and the "death of Francis, late dauphin of Viennoys." ii. A detailed statement of the controversy about Milan, headed: "Here followeth a declaration of Milan, whereupon is the chief contention between the Emperor and the French king; wherein is first declared a compendious summary of the estate of Millan, and under whose dominion it hath been from time to time. Second, the pedigrees or genealogies of the viscounts of Milan. Third, the first erection of it to a dukedom, and the genealogy of the dukes of Milan unto the Sforces. Fourth, the genealogy of the Sforces unto the last duke Francis. Fifth, the genealogy of the Dolphyn and duke of Orleans. And finally the allegations on both parts for the right and title of the same." Large paper, pp. 9. Endd. Harl. MS. 1757, f. 319. B.M. 384. Gregory Cortesius (fn. 11) to Pole. Contarini urged me yesterday to write to you to the same effect that he believed you yourself and Sadolet were about to write. Feels it would be presumptuous in him to criticise Pole's judgment, with whom he usually agrees, but does not see how he should succeed if he attempt anything against his own opinion. For though convinced that every one who was present at that meeting would give as candid an opinion of the writings of others as of themselves, he thinks it a matter of duty to abstain from anything that may disturb unanimity. Remembers this advice being given by the archbishop of Brindisi (Aleander). Hopes Pole will represent this to Contarini for his excuse. At the Quirinal. Lat. Add. : All'Illustriss. Sig. Reginaldo. 385. Grants in August 1536. 1. Sir Th. Audeley, chancellor. Mortmain licence to exchange with the abbot and convent of St. John's, Colchester, Essex, possessions to the annual value of 20l. Also to alienate other possessions to the annual value of 50s. to the rectory of Holy Trinity, Colchester, and to erect a rectory of one perpetual chaplain in the church or chapel of St. Michael in West Donylond alias Berechurch, Essex. Del. Westm., 1 Aug. 28 Hen. VIII.—S.B. Pat. p. 5, m. 8. 2. Hugh David, a yeoman of the guard. To be keeper of Mersley park in the lordship of Bromefyld, marches of Wales, formerly occupied by William Almer, and afterwards by Wm. Brereton, with 2d. a day and the herbage, &c. Also farm of a tenement near the pale, formerly used as a lodge of the said park lately in the tenure of the said William Brereton and now in the King's gift. Greenwich, 2 Aug. 28 Hen. VIII. Del. Westm., same day.—P.S. Pat p. 1, m. 28. 3. Sir Wm. Powlett, comptroller of the King's household. Grant of the site, buildings, &c. of the late abbey of St. Mary, Letley, Hants., Letley grange, Letley mill, and lands in the vill. and parish of Letley; the manor of Hownde, Hants., and lands, windmill, &c. in Hownde, Shetshaa, and Shalling, Hants. ; the manor of Townehill, Hants., and lands, &c. in Townehill and Shamulhurst, Hants., belonging to the said late monastery; also all lands, &c. in Winteney Herierde, Hants., the rectory or parsonage of that place; the manor of Waddon, Dorset, and the farm called Aisheley, Dorset, and all lands, &c. in Waddon and Aisheley; and all manors lands, &c. which Th. Stephins, late abbot of Letley, or Eliz. Martyn, late prioress of Wyntney, held in right of their respective monasteries. Annual value, 99l. 11s. 7d. ; rents 9l. 19s. 2d., and 9l. 12l. 6d. Otforde, 1 Aug. 28 Hen. VIII. Del. Westm., 3 Aug.—P.S. Pat. p. 3, m. 21. 4. Th. Delaryver, a sewer of the chamber. To have the offices of chief steward of the lordship of Raskell, York, and master of the game within the park there, lately held by Edw. Vaux. Greenwich, 3 Aug. 28 Hen. VIII. Del. Westm., 5 Aug.—P.S. Pat. p. 1, m. 29. 5. Anth. Kyngston To be serjeant of the King's hawks, with 2s. a day. Alyngton castle, 31 July 28 Hen. VIII. Del. Westm., 5 Aug.—P.S. Pat. p. 2, m. 15. 6. Anth. Kyngeston. To be master of the game in the chase of Corselaund, Glouc., with 10l. a year out of the issues of the earldom of Warwick. Alyngdon castle, 31 July 28 Hen. VIII. Del. Westm., 5 Aug.—P.S. Pat. p. 2, m. 15. 7. Cheshire: Commission to Sir Wm. Stanely, of Howton, John Massy, of Podyngton, Hugh Sterkey, and Wm. Halsall to make inquisition p. m. on the lands and heir of John Brige. —Pat. 28 Hen. VIII. p. 5, m. 1d. 8. Philip Tylney. Confirmation of a previous grant of the room of a soldier of Calais, with wages of 8d. a day from the 6 April last, notwithstanding the recent ordinances for Calais. Del. Westm., 5 Aug.  (fn. 12) Hen. VIII.—S.B. 9. Ric. Colye. To be bailiff of the lands and tenements in Macclesfelde forest, Cheshire, and of the forest there; during the minority of John Savage, with fees as enjoyed by Anth. Savage. Greenwich, 3 Aug. 28 Hen. VIII Del. Westm., 7 Aug.— P.S. Pat. p. 2, m. 18. 10. Sir Th. Clifford. To be captain of the town and castle of Berwick-on-Tweed and of the tower upon the bridge of the said town, with the usual fees, as enjoyed by Henry duke of Richmond and Somerset, late captain. Richmond, 7 Aug. 28 Hen. VIII. Del. Westm., 8 Aug.—P.S. Pat. p. 2, m. 19. 11. Sir Geo. Lawson and Th. Sotehyll. 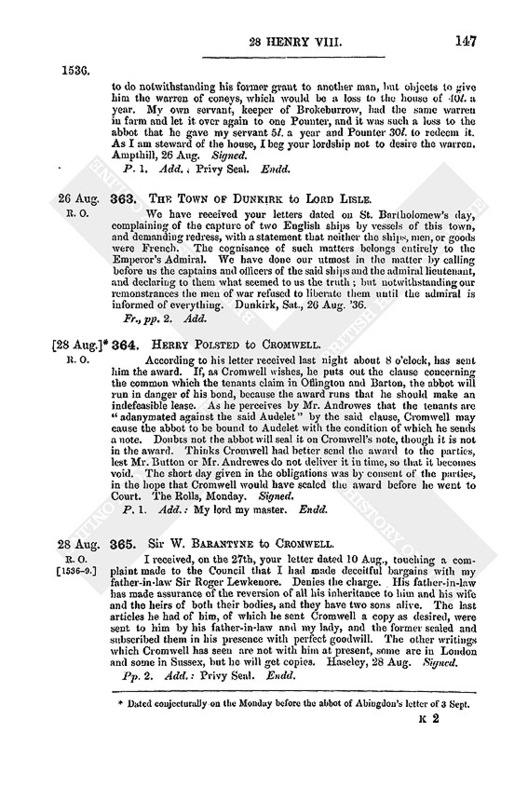 Grant in survivorship of the office of master of the ordnance and gunners of the town of Berwick, with 12d. a day, on surrender, by the said George, of patent 10 May 24 Henry VIII., granting the office to him and Laur. Hamerton. Richmond, 7 Aug. 28 Hen. VIII. Del. Westm., 8 Aug.—P.S. Pat. p. 2, m. 16. 12. John Gostwike, treasurer and general receiver of Tenths and First Fruits. Annuity of 200l. over and above a yearly fee of 100l. granted by patent 7 May 27 Hen. VIII. for the diet of himself, his clerks and servants, and for robes, &c.; the said fee of 100l. having been found insufficient to meet the expences of his office. Westm. Del. Tarling, 12 Aug. 28 Hen. VIII.—P.S. Pat. p. 3, m. 25. 13. Ric. Lee to be surveyor and paymaster of the fortifications, &c. of Calais and the marches, with 20l. a year, and men in wages, as Wm. Lelegrave lately had; also an annuity of 10l. and a messuage and mansion in the parish of St. Nicholas near the Boleyn gate, which Lelegrave also had. Richmond, 8 Aug. 28 Hen. VIII. Del. Westm., 12 Aug.—P.S. Pat. p. 2, m. 19. 14. Ralph Johnson, a sewer of the King's chamber. To be master of the decoy of swans in the river Thames, vice Geo. Assheby dec., which was granted for life to Ric. 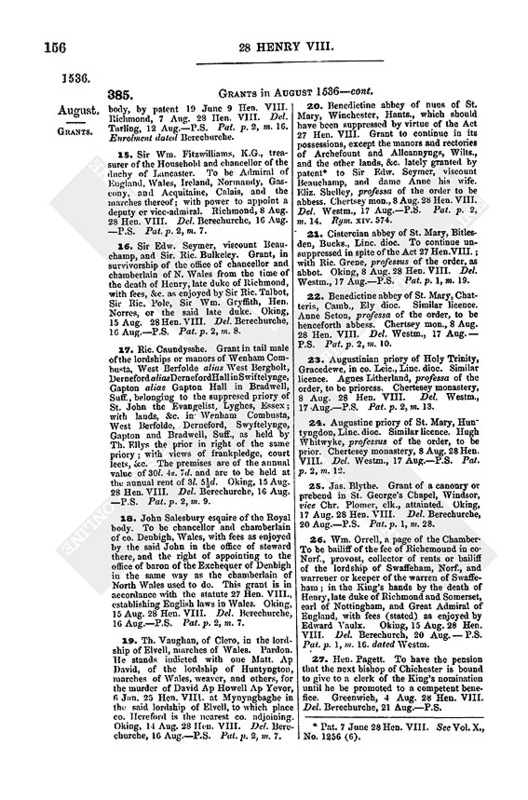 Weston, esquire of the Royal body, by patent 19 June 9 Hen. VIII. Richmond, 7 Aug. 28 Hen. VIII. Del. Tarling, 12 Aug.—P.S. Pat. p. 2, m. 16. Enrolment dated Berechurche. 15. Sir Wm. Fitzwilliams, K.G., treasurer of the Household and chancellor of the duchy of Lancaster. To be Admiral of England, Wales, Ireland, Normandy, Gascony, and Acquitaine, Calais, and the marches thereof; with power to appoint a deputy or vice-admiral. Richmond, 8 Aug. 28 Hen. VIII. Del. Berechurche, 16 Aug. —P.S. Pat. p. 2, m. 7. 16. Sir Edw. Seymer, viscount Beauchamp, and Sir. Ric. Bulkeley. 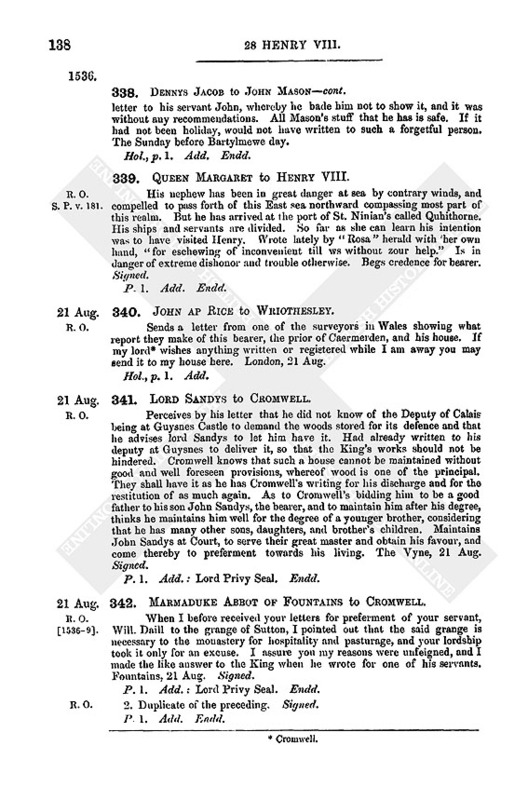 Grant, in survivorship of the office of chancellor and chamberlain of N. Wales from the time of the death of Henry, late duke of Richmond, with fees, &c. as enjoyed by Sir Ric. Talbot, Sir Ric. Pole, Sir Wm. Gryffith, Hen. Norres, or the said late duke. Oking, 15 Aug. 28 Hen. VIII. Del. Berechurche, 16 Aug.—P.S. Pat. p. 2, m. 8. 17. Ric. Caundysshe. Grant in tail male of the lordships or manors of Wenham Combusta, West Berfolde alias West Bergholt, Derneford aliasDernefordHall in Swiftelynge, Gapton alias Gapton Hall in Bradwell, Suff., belonging to the suppresed priory of St. John the Evangelist, Lyghes, Essex; with lands, &c. in Wenham Combusta, West Berfolde, Derneford, Swyftelynge, Gapton and Bradwell, Suff., as held by Th. Ellys the prior in right of the same priory; with views of frankpledge, court leets, &c. The premises are of the annual value of 30l. 4s. 7d. and are to be held at the annual rent of 3l. 5½d. Oking, 15 Aug. 28 Hen. VIII. Del. Berechurche, 16 Aug. —P.S. Pat. p. 2, m. 9. 18. John Salesbury esquire of the Royal body. To be chancellor and chamberlain of co. Denbigh, Wales, with fees as enjoyed by the said John in the office of steward there, and the right of appointing to the office of baron of the Exchequer of Denbigh in the same way as the chamberlain of North Wales used to do. This grant is in accordance with the statute 27 Hen. VIII., establishing English laws in Wales. Oking, 15 Aug. 28 Hen. VIII. Del. Berechurche, 16 Aug.—P.S. Pat. p. 2, m. 7. 19. Th. Vaughan, of Clero, in the lordship of Elvell, marches of Wales. Pardon. He stands indicted with one Matt. Ap David, of the lordship of Huntyngton, marches of Wales, weaver, and others, for the murder of David Ap Howell Ap Yevor, 6 Jan. 25 Hen. VIII. at Mynyngbaghe in the said lordship of Elvell, to which place co. Hereford is the nearest co. adjoining. Oking, 14 Aug. 28 Hen. VIII. Del. Berechurche, 16 Aug.—P.S. Pat. p. 2, m. 7. 20. Benedictine abbey of nuns of St. Mary, Winchester, Hants., which should have been suppressed by virtue of the Act 27 Hen. VIII. Grant to continue in its possessions, except the manors and rectories of Archefount and Allcannyngs, Wilts., and the other lands, &c. lately granted by patent (fn. 13) to Sir Edw. Seymer, viscount Beauchamp, and dame Anne his wife. Eliz. Shelley, professa of the order to be abbess. Chertsey mon., 8 Aug. 28 Hen. VIII. Del. Westm., 17 Aug.—P.S. Pat. p. 2, m. 14. Rym. XIV. 574. 21. Cistercian abbey of St. Mary, Bitlesden, Bucks., Linc. dioc. To continue unsuppressed in spite of the Act 27 Hen. VIII. ; with Ric. Grene, professus of the order, as abbot. Oking, 8 Aug. 28 Hen. VIII. Del. Westm., 17 Aug.—P.S. Pat. p. 1, m. 19. 22. Benedictine abbey of St. Mary, Chatteris, Camb., Ely dioc. Similar licence. Anne Seton, professa of the order, to be henceforth abbess. Chertsey mon., 8 Aug. 28 Hen. VIII. Del. Westm., 17 Aug.— P.S. Pat. p. 2, m. 10. 23. Augustinian priory of Holy Trinity, Gracedewe, in co. Leic., Linc. dioc. Similar licence. Agnes Litherland, professa of the order, to be prioress. Chertesey monastery, 8 Aug. 28 Hen. VIII. Del. Westm., 17 Aug.—P.S. Pat. p. 2, m. 13. 24. Augustine priory of St. Mary, Huntyngdon, Linc. dioc. Similar licence. Hugh Whitwyke, professus of the order, to be prior. Chertesey monastery, 8 Aug. 28 Hen. VIII. Del. Westm., 17 Aug.—P.S. Pat. p. 2, m. 12. 25. Jas. Blythe. 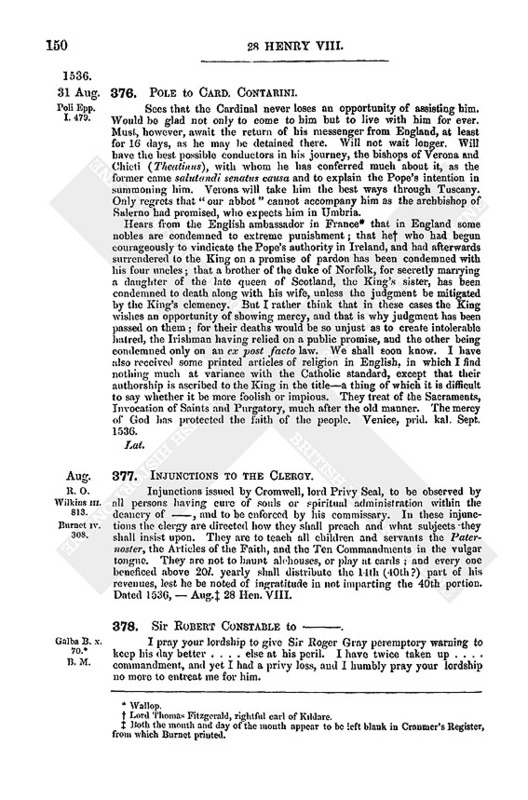 Grant of a canonry or prebend in St. George's Chapel, Windsor, vice Chr. Plomer, clk., attainted. Oking, 17 Aug. 28 Hen. VIII. Del. Berechurche, 20 Aug.—P.S. Pat. p. 1, m. 28. 26. Wm. Orrell, a page of the Chamber. To be bailiff of the fee of Richemound in co. Norf., provost, collector of rents or bailiff of the lordship of Swaffeham, Norf., and warrener or keeper of the warren of Swaffeham; in the King's hands by the death of Henry, late duke of Richmond and Somerset, earl of Nottingham, and Great Admiral of England, with fees (stated) as enjoyed by Edward Vaulx. Oking, 15 Aug. 28 Hen. VIII. Del. Berechurch, 20 Aug.—P.S. Pat. p. 1, m. 16. dated Westm. 27. Hen. Pagett. To have the pension that the next bishop of Chichester is bound to give to a clerk of the King's nomination until he be promoted to a competent benefice. Greenwich, 4 Aug. 28 Hen. VIII. Del. Berechurche, 21 Aug.—P.S. 28. John Hebburne, clk., parson of Spellocke, marches of Calais. Licence of non-residence, notwithstanding the statute 27 Hen. VIII. Chertsey mon., 11 Aug. 28 Hen. VIII. Del. Berechurch, 21 Aug. —Pat. p. 2, ms. 8, 9. 29. Th. Hennage. 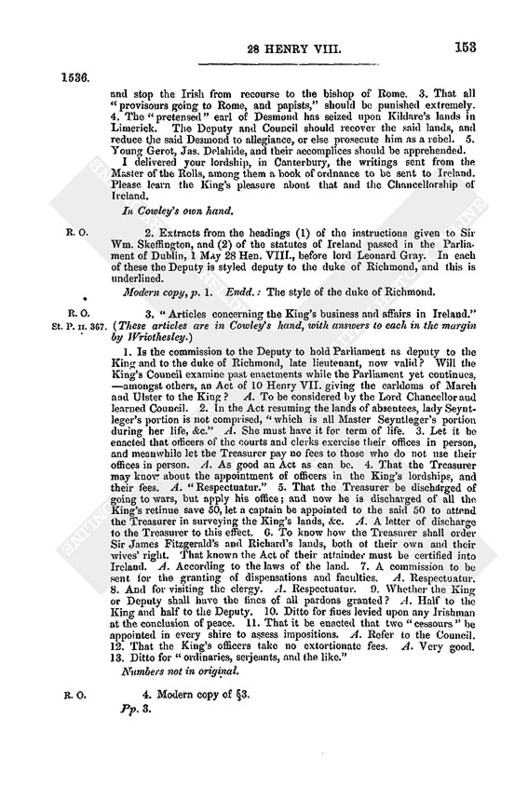 Grant of the King's interest in a lease, lately held by Wm. Brereton, attainted, of a capital messuage or mansion place called Ducketts, in the parish of Totnam or Harryngay, alias Harmesey, Midd., and other lands, tenements, &c. in Harryngay alias Harmesey and Tottenham, Midd., for a certain term of years not yet expired; which lease was made to the said William, and Hen. Brereton his son and heir apparent, by the master and brethren of the hospital of St. Bartholomew, West Smythfield in London, and dated 16 July 27 Hen. VIII. Chertsey monastery, 9 Aug. 28 Hen. VIII. Del. Berechurch, 23 Aug.—P.S. Pat. p. 1, m. 28. 30. Sir Humph. Lisle. Grant in fee simple of the manors of Felton, Gosford, Newton Hall, Berle, Hawkwell, Woodbourn, and Thornton, Northumb. ; and all messnages, &c., in the vills, parishes and hamlets of Felton, Gosford, Newton Hall, Berle, Hawkwell, Woodeburn, Thornton, Riddismouth, South Boteland, Wallikhall, Hexham, Kyrke Haule, and Newton Underwood, and the town of Newcastle-uponTyne; with court leets, views of frankpledge, &c. Berechurch, 23 Aug.—Pat. 28 Hen. VIII., p. 4, m. 24. 31. John, abbot of Bury St. Edmunds. License to permit any one of his servants during his life to shoot with a cross-bow at all manner of deer and wildfowl in his parks and grounds, and wherever else he has warrant so to do, notwithstanding the Act 25 Hen. VIII. Del. Berechurch, 26 Aug. 28 Hen. VIII.—S.B. Pat. p. 3, m. 25. 32. Th. Gold, of Hese, Midd, alias of the Middle Temple, London. General pardon. Del. Berechurch, 26 Aug. 28 Hen. VIII.—S.B. Pat. p. 3, m. 25. 33. Th. Lancastre, S.T.B. Presentation to the parish church of Hoffkyrke, Canterbury dioc., void by resignation. Richmond, 7 Aug. 28 Hen. VIII. Del. Berechurche, 27 Aug.—P.S. Pat. 28 Hen. VIII., p. 2, m. 18. 34. Carthusian priory of St. Michael near Hull, York dioc., in the county of the town of Kingston ("Villæ Regiæ,") upon Hull. To continue, notwithstanding the Act 27 Hen. VIII., with Ralph Malyvere, professus of the said order, as prior. Oking, 17 Aug. 28 Hen. VIII. Del. Berechurche, 28 Aug.—P.S. Pat. 28 Hen. VIII., p. 1, ms. 31, 32. 35. Abbey of St. Mary and St. Clare, Denney, Camb., Ely dioc. Similar licence. Eliz. Throgmerten, professa of the order of St. Clare, to be abbess. Oking, 17 Aug. 28 Hen. VIII. Del. Berechurche, 28 Aug. —P.S. Pat. p. 1, ms. 30, 31. 36. Anth. Fenton. To be a forester and keeper in Galtresse forest, with fees of 4d. a day; on surrender of patent 21 Jan. 20 Hen. VIII., granting the same to Th. Curven, Esq., now knt., the office having been previously held by Edw. Woode, deceased. Gilford, 29 Aug. 28 Hen. VIII. Del. Berechurch, 30 Aug.—P.S. Pat. 28 Hen. VIII., p. 2, m. 17. 37. Hen. abbot of St. Mary of Graces near the Tower of London. Licence to hold in commendam along with his present abbey the Cistercian monastery of Coggeshall as soon as it shall be vacant. Esthamstead, 31 Aug. 21 Hen. VIII.—P.S. No date of delivery. 38. John Sheperde. Reversion of the mastership of the hospital of St. John the Baptist, Armeston, Northt., Linc. dioc., on the next vacancy, notwithstanding the said John's being a married man. Esthamsted 28 Aug. 28 Hen. VIII. Del. Berechurche 31 Aug.—P.S. Pat. 28 Hen. VIII., p. m. 17. 3. So Chapuys still continues to call him in all his letters. 4. Valerius Orsini, prince of Ascoli. 5. Dated conjecturally on the Monday before the abbot of Abingdon's letter of 3 Sept.
6. William More. See Audeley's letter, 18 Sept. following. 7. See Vol. IX., No. 501, which is probably of this year. 9. Lord Thomas Fitzgerald, rightful earl of Kildare. 10. Both the month and day of the month appear to be left blank in Cranmer's Register, from which Burnet printed. 11. Abbot of San Giorgio Maggiore at Venice, afterwards Cardinal (See Brown's Venet. Calendar). 13. Pat. 7 June 28 Hen. VIII. See Vol. X., No. 1256 (6).